When I bought my first orchid, I was advised to use a clear plastic pot. I was told it would create a moist environment and allow me to keep an eye on the health of the roots. Most orchid fanciers – orchidist if you’re a stickler for nomenclature – will have heard similar advice. Now, and as I’ll explore in a minute, this isn’t entirely wrong. In fact, every orchid I bought came in a plastic pot. It was only when I travelled to Asia that I learned there were alternatives. 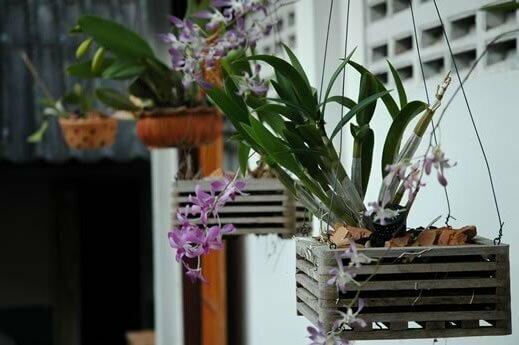 The Asians have a habit of hanging orchids from branches in little wooden boxes, with the roots dangling down. I remember thinking how much better they looked compared to clear plastic pots. Since then, I’ve seen pots made from slotted terracotta, mesh and even wire. In this article I want to dig a little deeper into the topic, have a look at some of the pros and cons of the different pots on offer, and pick my favourites. Let’s dive in. Click here to jump to my top 5 picks. An article about pots might seem rudimentary. You can’t get more basic. Yet I wouldn’t be surprised if new growers (even those with more experience) haven’t given the topic much thought. All pots are meant to mimic natural environments. Even orchids that have undergone decades of selective breeding have more or less the same requirements as their early ancestors. For the most part, orchids evolved in tropical and temperate rainforest. Ceramic pots, originally the only type available to collectors, were most commonly used before (and some time after) the invention of plastic. We have the Victorians to thank for designing pots with holes in them. 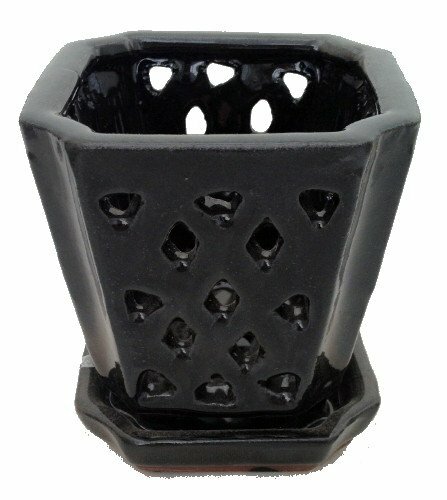 Clay pots, with or without extra holes, are best for attentive growers. 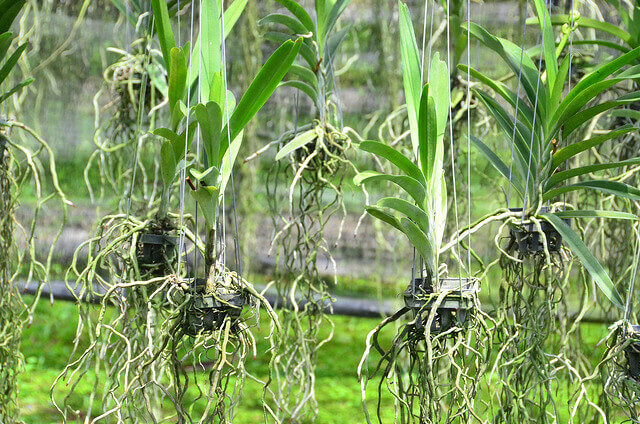 Clay breathes far better than plastic so orchid roots will benefit from increased aeration. Whilst orchids in clay pots will need regular, frequent watering, it will be virtually impossible to overwater them. Plastic pots will retain more moisture (so are good if you regularly forget to water). They also let you keep an eye on the health of the roots. Orchid roots tend not to like sitting in water for long periods so it’s important to let plastic pots dry out between each watering. Plastic pots also have the benefit of allowing sunlight to reach the roots. You can also buy plastic pots with lots of slats. 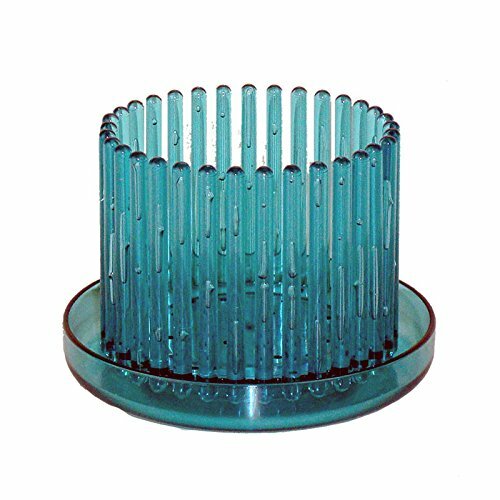 These favour aeration over water-retention and are ideal for placing inside more decorative pots. What about wood and wire pots? 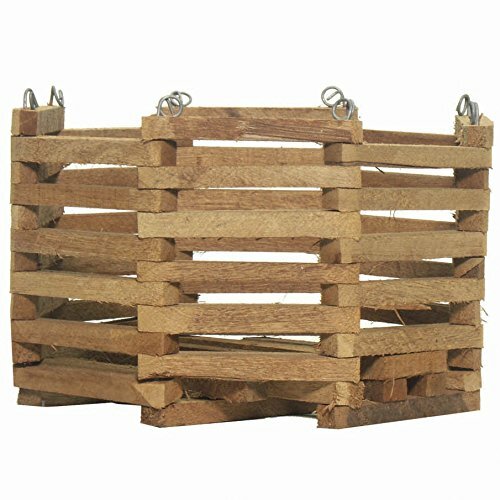 Wood and wire “baskets” are an alternative to plastic and terracotta pots and look excellent hung either inside or out (climate allowing). As long as they’re left to fully drain in the sink or bath after watering, there’s no issue with hanging them indoors. They offer the best aeration but the downside is that the roots will dry out much quicker. In humid rainforest with regular downpours, this isn’t a problem. Your dry kitchen, however, is another matter. If you’re more the hands-off type, then the regular watering that orchids in open-slatted containers demand may mean that they’re not a viable option. Do different orchids need different pots? With all the information above in mind, there’s one more thing to consider. You choice of pot should be dictated in part by an understanding of the conditions preferred by the genus of orchid you’re growing. Different orchids favour different environments. Terrestrials like Paphiopedilum will favour a moister environment (think plastic) while epiphytes like Vanda should be given ample drainage. If you’re looking for a good-quality, inexpensive option then you can’t go far wrong with this product from Millard. As I mentioned earlier, these slatted pots are best for putting into ornamental pots and are ideal for orchids that require good airflow. They’re also good for hanging if that’s what you want to do (although I personally think the wood pots are better for that). The pots are 4 in. deep and have a top diameter of just over 5 in. 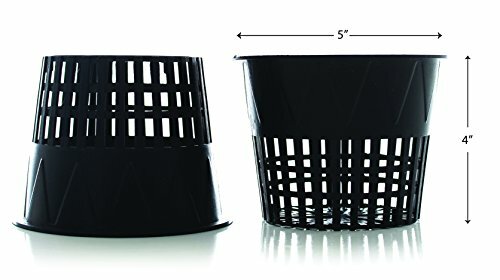 A common issue with these plastic pots is that can be flimsy and prone to splitting. This particular product, however, is very sturdy and durable. One pack includes twenty pots. Of all the products I sampled, this simple cedar basket is one of my favourites. It’s very well made (with hooks for hanging) but doesn’t look overdone. It still has a rustic, homemade feel about it. With a circumference of 10 in. it’s big enough to hold heavier orchids with tall blooming stems. As I mentioned earlier, these pots are ideal for epiphytic orchids like Vandas. The slits aren’t too big either so will hold coarse bark well. The wood is treated, which means that the pot as a whole will stand up to repeated watering. It’s not too pricey either! If the cedar basket from Sun Bulb is one of my favourites then this is my favourite. The holes are apparently a Victorian invention and they work brilliantly to improve the airflow over the roots of orchids. As with the advice above, err towards more epiphytic genera for this kind of pot. Because these pots are handmade, each one is unique. They have a wonderful rustic feel about them (they don’t look as though they’ve just rolled off a production line). It has a top diameter of 5 in. and a depth of 6 in. It also comes with a drainage plate. Because of the way they are made they do have quite a rough finish – so might scratch smooth surfaces. If you like the ceramic slatted design but not the rough finish of the pot above, then this piece from Hirts (or any of the others in different colours) might be ideal. At only 3.5 in. by 4 in. it’s smaller than the HomArt pot, but it has a glazed finish and the saucer also has felt legs to prevent any scratching. It’s also inexpensive! Personally, I like these for my smaller orchids and I think that different colours look great together. If you’re potting orchids on, propagating by division or from offshoots, then these are perfect. Want something a bit different? 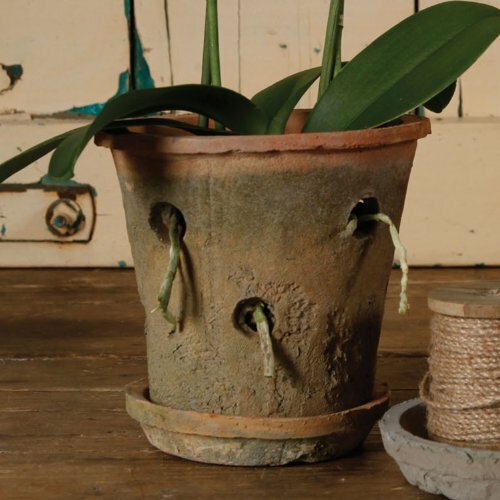 These pots from rePotme – a German company that sell a number of orchid-related products – have a quirky design, come in a range of different colours, and are ideal for orchids with air and light-loving roots. They’re 3 in. (high) by 3.75 in. wide. One of the cool things about these pots is the way that the roots poke out of the sides. You can “braid” them through the tines to create an even more interesting effect. Great for certain genera of orchids like Phalaenopsis and, though a touch on the pricey side, well worth the money in my humble opinion! What are your thought? Leave a comment below! What are your thoughts? Have you tried any of the pots on this list? Leave a comment below and let me know! Orchid Wall by spinster cardigan; Hanging Orchids by Audrey Scott; Hanging Orchids by Robert Schrader. Growing up in Hawaii with a mother that grew hundreds of orchids the one medium that stands out to me is called Hapu’u which was from a fern in the forest. The orchids just rooted in them well. But now they are threatened to the brink of extinction so that is no longer an option. But they grew beautifully in her hot house as well as haleconia. The wood boxes were also used filled with fragments of hapu’u. So my choice would be the wooden cedar boxes filled with bark or the ceramic pots with holes. All great choices. Thanks for your info. Enlightening. Hey Melinda, what a wonderful story 🙂 I wonder if it might be possible to replace Hapu’u with a similar fern, as the mix of bark and softer medium does seem to work very well. of the recommended pots, any particular type you would favor for brassolaeliocattleya? I’ve always had phalaenopsis up until now, and am planning for a couple of years down the road with this new-to-me orchid. Hey Rebecca, my understanding is that Cattleyas like things quite dry (or rather not overly wet) so a clay pot with holes in might be the way to go. I’d avoid the moisture holding plastic ones.